90s TV fans rejoice – The Crystal Maze is back, complete with original host Richard O’Brien! Have you got your ticket yet? Whether or not you’ll be joining the Crystal Maze ranks when the ‘live immersive experience’ opens, here are 13 things that only true fans will remember from their youth. How many do you remember? 1. Richard O’Brien: the original – and best – Crystal Maze host. Fun Richard O’Brien fact: Before starting his hosting duties on The Crystal Maze, Richard O’Brien wrote the cult musical Rocky Horror Picture Show, co-wrote the screenplay for the 1975 film adaptation and even starred as Riff Raff in the film. Piercing the contestants’ cries of ‘try turning the cogs!’ and ‘press U3!’ during games was O’Brien and his trademark harmonica, which served to keep him (and the audience) amused when the contestants were being a bit rubbish. O’Brien ruled the Crystal Maze with the help of his ‘Mumsy’ and her lover Ralph the Butler, and later Aunt Sabrina. Eventually our intrepid host left the show to live with Mumsy and Ralph, leaving Ed Tudor Pole to take over the helm. Fun ‘Mumsy’ fact: Actress Sandra Cohen also played Fanny in Carry On Camping in 1969. 6. Being told off for shouting at the TV when stuff like this happened. And Richard O’Brien’s exasperated comments between the shouting. 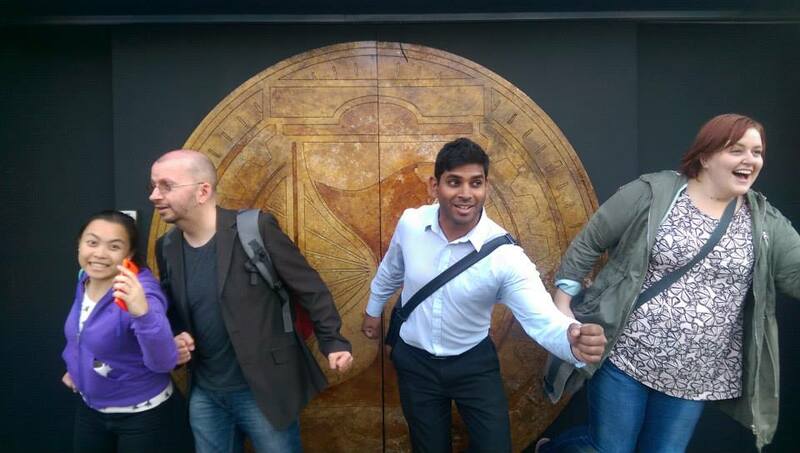 Fun fact: Only 17 teams ever actually ‘won’ The Crystal Maze. When a contestant failed to finish a game and didn’t get out before the time expired, their team-mates had to choose to either sacrifice a crystal to get them out, or leave them in there. Things got a little awkward when they decided that their colleague wasn’t worth it, and the offending contestant was left to wait out the rest of the show on their lonesome. 8. The guy who slips over just running between games during the theme song. As well as all the other fails they decided to include in each theme song before every episode. Fun Crystal Maze theme song fact: It’s called Force Field. Really?! Only five? Bit harsh considering all the work it took them to get them there in the first place. 10. And, while we’re at it, how do you avoid catching silver tokens while they’re flying around like this? 11. How some of the games seemed pretty impossible. And no one could decide whether that was a good thing or not. And how that ‘consolation prize’ now seems like a much better prize than whatever it was the winners got. Think you can puzzle your way out of a locked room, just like the contestants in The Crystal Maze? Well, you can all across London, and we’re going… want to join us? Even the creators of The Crystal Maze experience in London put the success of their venture down to the popularity of escape games, and it’s not hard to see why: just like the cult TV show, they require skill, mental agility and have enough mystery to leave you wanting more! Sound good? Then join thinking bob for just £1 and come along to one of our upcoming escape game events…did we mention we get a discount at all of them? Just one of the many perks of being part of the community. Check out our partners page to see where else you get exclusive deals. Can’t make any of these? Then keep an eye on our socials page to see when we’re going next. Read our run-down of the 10 best escape games in London.